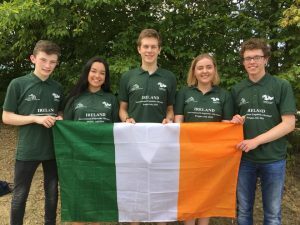 Five secondary students represented Ireland at the International Linguistics Olympiad (IOL) in Prague from 26-30 July. Leo Doherty (Lumen Christi, Derry), Eimear Kyle (St Finian’s, Mullingar), Philip	Krause	(Ashton School, Cork), Lucy Dornan (St Andrews, Blackrock, Dublin) and Daniel Quigley (Belfast Royal Academy) competed in individual and team competitions at the week-long Olympiad. The event tests participants’ problem-solving and logic skills by challenging them to decode unfamiliar languages. This year they tackled problems on Creek, Hakhun, Terêna, Mountain Arapesh (Bukiyip) and Akan.